The present improved animal trap and unique catch eliminates substantial eating or removal of the bait without the trap activating. This is accomplished by an improved catch which supports a piece of bait, and in turn, the bait blocks the movement of the holding arm bar. Only upon disturbance of the bait, will the holding arm bar be permitted to release from the catch due to the bait no longer blocking the movement of the holding arm bar. One embodiment accomplishes this action through a bait gap formed in the catch. The holding arm bar is aligned with the bait gap, such that the holding arm bar should pass through the bait gap in order for the pivoting kill bar hammer to snap closed against the top surface of the platform. 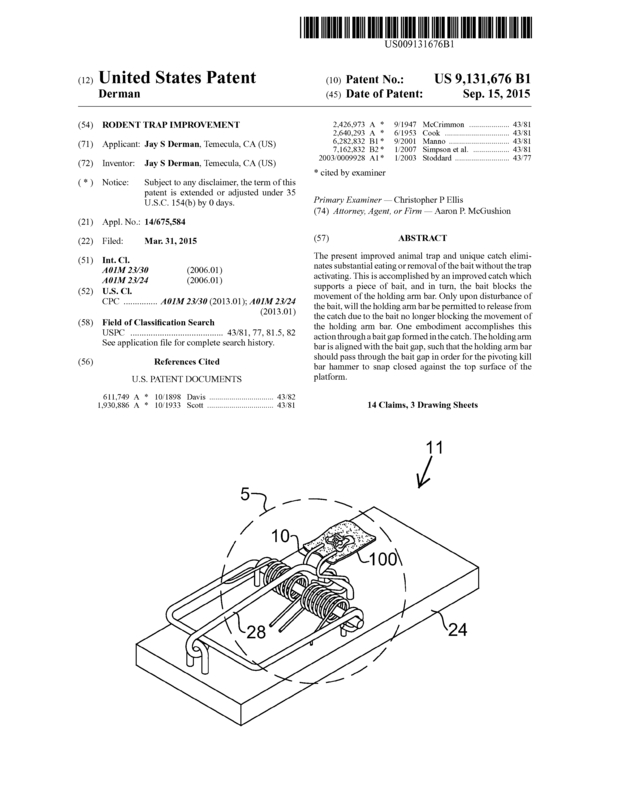 Page created at 2019-04-25 14:43:41, Patent Auction Time.